celebrated for its talent in civil trials." 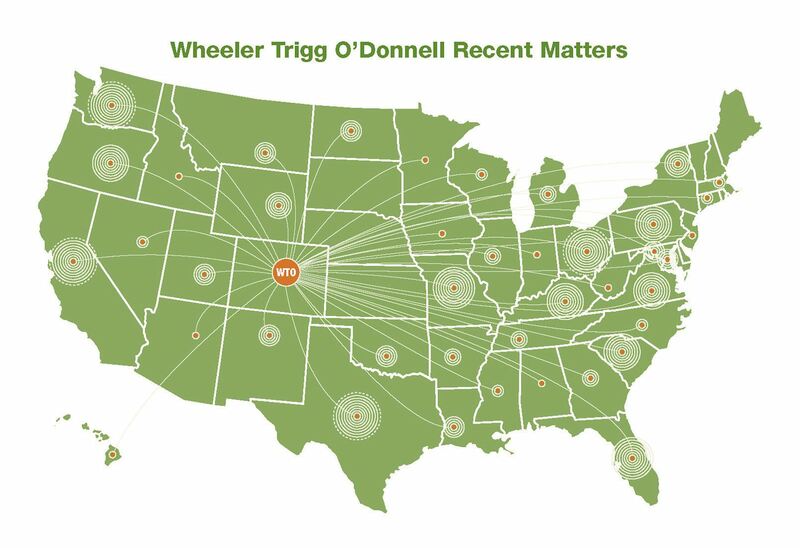 With offices in Denver, St. Louis, and Atlanta, Wheeler Trigg O'Donnell excels at all stages of complex civil litigation—pretrial, trial, post-trial, and appellate—for sophisticated clients nationwide. The firm is recognized nationally for its significant experience in substantive practice areas of interest to corporations, including commercial litigation, product liability, employment, franchise, insurance, personal injury defense, intellectual property, and professional liability. We use the knowledge gained through our extensive trial experience to our clients' advantage when conducting internal investigations, early case assessments, pre-trial negotiations, and counseling to avoid future litigation. Coordinate internal investigations and compliance audits, management analyses, and media relations, while simultaneously developing strategies for litigation, arbitrations, regulatory, and legislative responses to complex corporate emergencies. Although efficient resolution of disputes is central to our work, we and our clients often develop and execute litigation strategies designed not only to resolve cases, but also to shape or change the law in ways beneficial to our clients' larger litigation and business interests. However, we recognize and accept that litigation strategies must be driven by our clients' business strategies and interests – never the other way around. Our primary interest is to provide advocacy and advice that best promotes our clients' business success. Our core strength is the quality, commitment, and cost-effectiveness of our lawyers. Because of our reputation, the quality of our clients, and the challenges posed by our clients' legal problems, we have succeeded in attracting and retaining first-rate lawyers at all levels of our professional cadre. Further, our geographical location and efficiency-driven business model enables us to offer our services at rates significantly below the price of comparable services available in larger firms based in more expensive markets. We believe we have the rare experience and ability to work successfully with other law firms to accomplish our clients' goals. We do precisely that every day. We serve or have served recently as national or regional trial counsel for more than a dozen Fortune 500 companies. We can operate at a high level for a relatively small firm not only because of our skill set and experience, but, equally importantly, because we work effectively with other counsel from large national firms, regional firms, and case-specific firms and lawyers throughout the country. 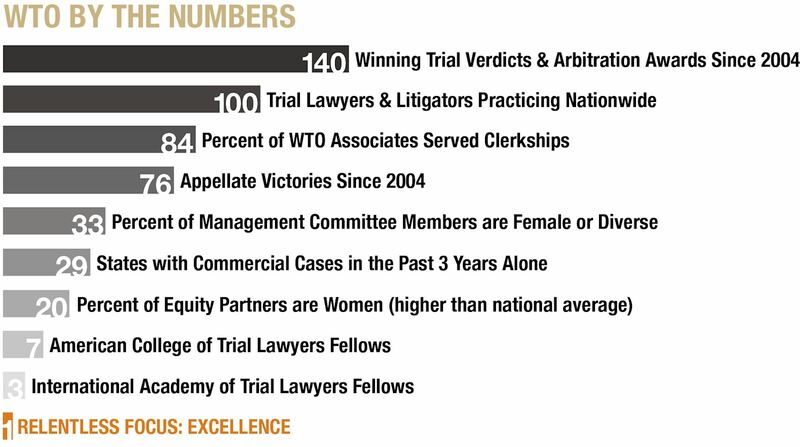 The trial capacity of Wheeler Trigg [O'Donnell] is beyond doubt, but the firm is also notable for its strategic and management input, while general counsels with one eye on the bottom line welcome its relatively spartan staffing of matters. In the era of ‘virtual law firms,' when costs can skyrocket and playing nicely with other firms is of paramount importance, the currency of Wheeler Trigg has never been higher. Our firm structure neither depends on nor is geared toward considerations of leveraging high partner-associate ratios, keeping work within our own firm, or maximizing staffing levels or billable hours. Consequently, we are completely comfortable in partnering with, or retaining and supervising, lawyers from other firms who can bring to bear resources or specialized expertise best suited to the accomplishment of our clients' goals. We have many years of experience working in close collaboration with other firms and lawyers, including members of many of the largest and best law firms in the nation, and we take pride in making these teams work effectively and efficiently for our clients' interests.